Life is full of flavour! Here, gastronomy means living memorable experiences, and a place to sample haute cuisine dishes prepared with a meticulous selection of fresh, healthy and great tasting products. Our culinary offer will surprise you with a refined à la carte cuisine, themed buffet, live cooking, “Detox” menus, healthy products of the highest quality, prepared by passionate professionals and personalized menus from our expert nutritionists. We offer an area reserved for families and a “Children Only” zone. Here the little ones will be shown the importance of respecting the environment, learning to recycle and to value natural, local products which are in season. Signature cuisine that maintains the essence of Canarian gastronomy, where a simple ingredient can turn into an amazing dish. 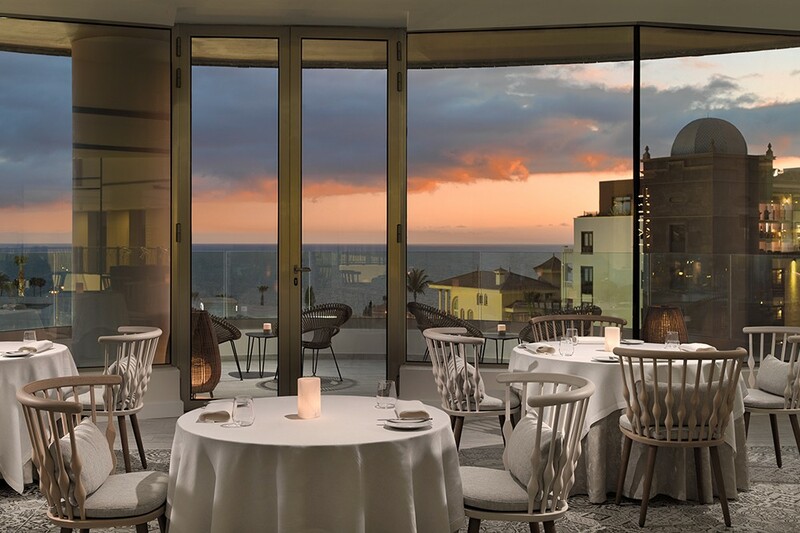 Panoramic windows, showing the most impressive sunsets over the ocean which add to the warm ambience. Exquisite attention and countless reasons to enjoy unforgettable experiences. Open from Tuesday to Saturday. A varied menu for all ages with drinks designed for all tastes. Perfectly located in the family pool area, offering a large terrace where you can sample delicious meals, from 12:30 to 16:00. All our bars in the pool areas offer waiter service at the sun loungers so we can take care of you while you continue to enjoy the sun and our fantastic pools. Awaken your senses with the musical notes of the live piano or the diverse shows which you will find here. The beauty and modernity of the venue create a magical ambience and the delicious and varied cocktails will surprise you with their flavours, colours and perfumes. A luxurious and modern rooftop terrace where you can enjoy a “chilling” atmosphere and a magnificent selection of cocktails created by the best National and International Bartenders. Here you can see some of the most spectacular sunsets of the whole island! Don´t miss the opportunity of trying our famous hanging pool. Its walls and floor have panoramic glass and … it will seem like you are floating in the air! FROM 10:30 A.M. TO 6:00 P.M.
Offering a range of refreshing and healthy drinks, which are the complement for a very healthy holiday. Seasonal, exotic and local fruits… choose your favourites, combine them and be amazed with new flavours. Undoubtedly, you will have an incredible relaxing time, with the Canary climate and enjoying your drink by the pool. * All our bars have D-TOX. service.